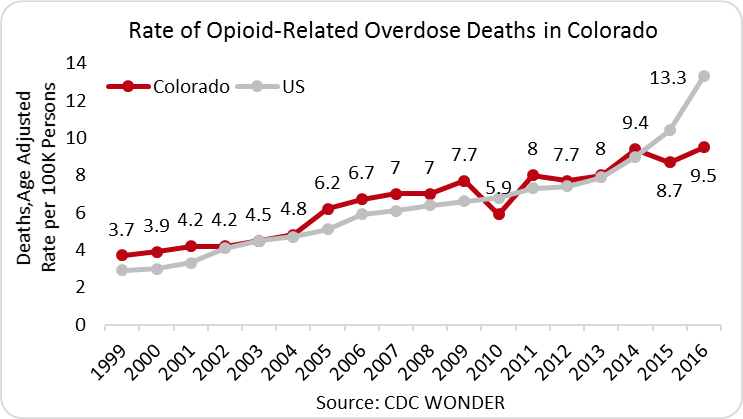 In 2016, there were 536 opioid-related overdose deaths in Colorado, a rate of 9.5 deaths per 100,000 persons compared to the national rate of 13.3 deaths per 100,000 persons. 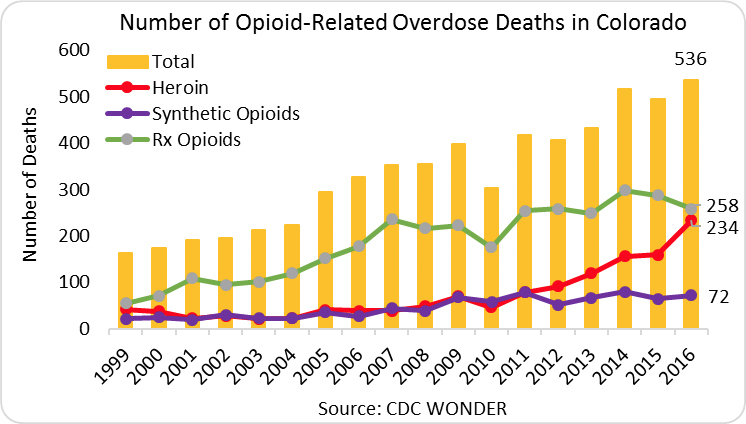 From 2012 to 2016, the number of heroin-related deaths increased from 91 to 234 and deaths related to synthetic opioids rose from 52 to 72. In 2013, Colorado providers wrote 69.8 opioid prescriptions for every 100 persons (approximately 3.7 million prescriptions). In the same year, the average U.S. rate was 79.3. 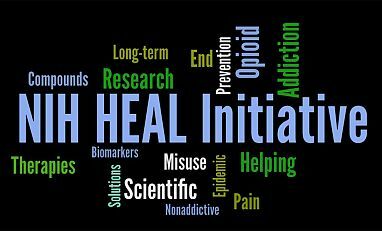 Since then, opioid prescriptions in the United States have declined, with a 6.0 percent decline in Colorado from 2013 to 2015, resulting in an estimated 63.7 opioid prescriptions per 100 persons (3.5 million prescriptions) in 2015 (IMS Health, 2016). The incidence of NAS in Colorado has increased from 0.4 per 1,000 births in 1999 to 2.9 per 1,000 births in 2013, a more than sevenfold increase. The average across the 28 states included in the 2013 analysis was 6.0 per 1,000 births (CDC, MMWR, 2014). State Incidence: Of the new HIV cases in 2015, 373 occurred in Colorado (a rate of 8 per 100,000 persons), with 10.9 percent 1 of new cases in males and 17.3 percent of new cases in females attributed to IDU (AIDSVu). State Prevalence: In 2014, an estimated 11,199 persons were living with a diagnosed HIV infection in Colorado-a rate of 252 per 100,000 persons. Of these, 17.0 percent 1 of males and 24.8 percent of females were living with HIV attributed to IDU (AIDSVu). State Incidence: In 2016, Colorado reported 4,865 cases of chronic HCV and 41 cases of acute HCV at rates of about 90.0 per 100,000 persons and 0.7 per 100,000 persons, respectively. Where data were available, about 47 percent of acute cases and 2.4 percent of chronic cases reported IDU. (Colorado.gov). State Prevalence: As of 2010, an estimated 66,100 persons were living with HCV in Colorado (HepVu).